A WAR MEMOIR OF UNUSUAL LITERARY BEAUTY and power from the acclaimed poet who wrote the poem The Hurt Locker. 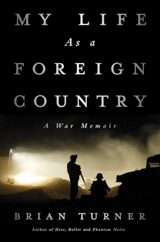 My Life as a Foreign Country follows the experience of one soldier in one recent war – the preparations, actions, homecomings and infinite aftermath – but then explodes from those narrow limits. Unburdened by nostalgia, hollow sympathy or a journalistic hunger for fact, this account combines the recalled with the imagined, and leaps centuries and continents to seek parallels in the histories of other men. The result is an opportunity to enter the head of a man still stalked by war, to experience conflict with new definition and lasting effect. "His poetic gaze irradiates his world, and he draws us, fascinated and horrified, into the innermost coils of war." "This memoir enacts the journey of an epic poem where war, and love,and unspeakable grief accrue sensations, stories and names, like a sharp blade upturning earth—a movement that builds and turns until the collection grows speedily into a whole picture, a symphonic sweep, and the reader learns that Brian Turner is a born storyteller." "Brian Turner has given us not so much a memoir as a mediation, rendered with grace and wit and wisdom."